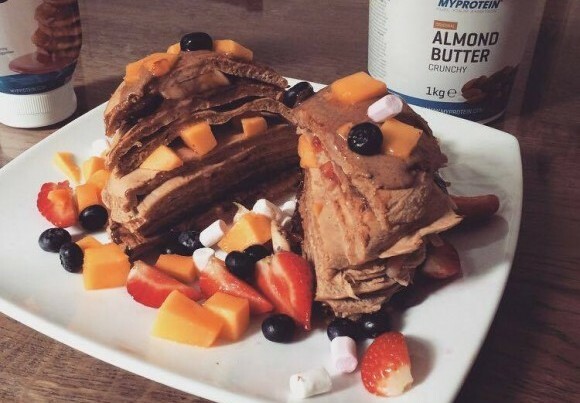 Here is my recipe of pancakes, obviously the one I did on the picture isn’t really ideal when you are trying to lose weight…. However sometimes it’s just so nice to be naughty! Put some Coconut oil in a hot pan…. Cook on both side but not too much you don’t want it too dry! Here you go … and guess what… Thats under 200 kcal! Also so good in this kind of breakfast it’s around 23g of protein! So very good to maintain and develop your muscle mass. You can if you want add some protein powder to it if you are really trying to increase your protein intake but don’t over add it. As you can read the recipe is the healthy version of my pictures…. For the cheatmeal version / pancake on the picture you can add anything you want! Oh my god! This sounds like heaven right now! Can’t wait to be Sunday morning! There are so many different version of Healthy or Naughty Pancakes, so I’m pretty sure you will find one that you will love! Even if you eat gluten free, Myprotein sell some Gluten Free Oats! And I can tell you for fact that it’s really good! Next Post Why should Women take protein shake ?